Insurer says the GOP’s health care plan would raise premiums 30 percent. Paul Ryan pointing at things. 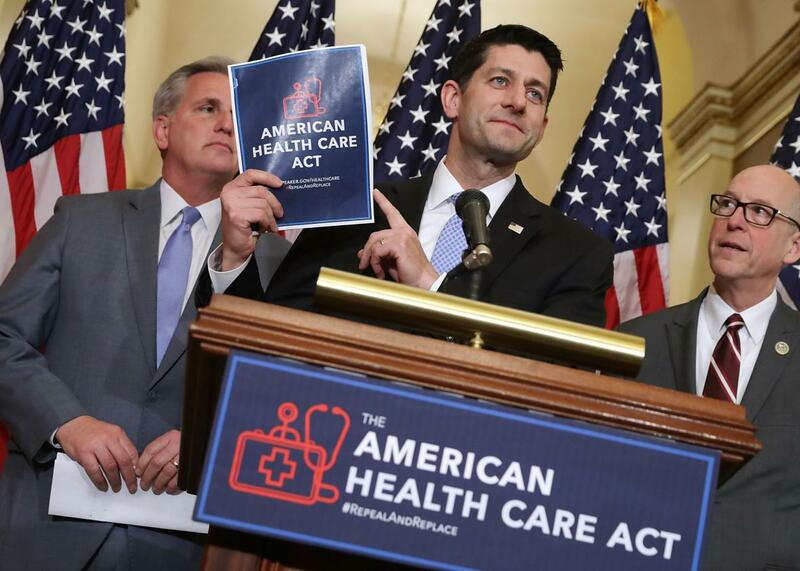 Aside from cutting taxes on the wealthy and choking off Medicaid, House Speaker Paul Ryan’s health care plan pretty much had one job: make insurance cheaper. It wasn’t supposed to expand coverage. It wasn’t really supposed to add any new protections for consumers. It was just supposed to make it possible for insurers to sell bare-bones plans with lower premiums, which in turn might let Washington spend less money subsidizing coverage. How come? Because, as I wrote at length Tuesday, the legislation would almost certainly make it even easier for people to wait until they were sick to buy health insurance, which would be a disaster for insurers and the market. Ryancare would keep rules in place that force carriers to enroll people with pre-existing conditions. But it would junk the individual mandate that requires Americans to buy insurance, replacing it with a weak rule that says insurers can charge new customers 30 percent extra for a year if they have a gap in their coverage history. It’s a fairly toothless rule that, if anything, may turn out to be counterproductive, since the surcharge could convince some young people to stay uninsured until they absolutely needed care. It almost certainly won’t encourage enough healthy Americans to buy coverage to create a healthy insurance market. [He] believes that defanging the coverage mandate could help push individual-plan premiums up by 30% or more next year—and they could rise considerably more in the future, when the reduced federal assistance for low-income enrollees kicks in. That shift, he estimated, could shrink enrollment in ACA plans by three-quarters or more, leaving a smaller, less-healthy group of consumers. “You’re going to see big rate increases, and you’re going to see insurers exit markets…this is going to destabilize the marketplace,” he said. Dr. Molina added that the proposal’s help for insurers, including the penalty for consumers who have gaps in their coverage, wasn’t enough to offset the negatives. Molina has said it is reconsidering its ACA marketplace offerings. Molina isn’t the only insurance executive sending warning signals in the WSJ’s piece, but he’s an interesting source. His company was one of the few carriers to make a profit on Obamacare’s exchanges during their early rollout. However, it lost money on them in 2016 thanks to the health law’s “risk adjustment” scheme—which forces companies that sign up a lot of healthy, profitable customers to pay into a fund that helps cover the costs of insurers that enroll too many sick individuals. He would like to see the ACA tweaked (preferrably in a way that would benefit his company) but thinks it’s fundamentally sound. So you could argue that Molina’s warnings are just hyperbole from a CEO that’s worried about losing his meal ticket. Or you could say they’re the insights of a guy who has a pretty keen sense of how these markets actually work. I tend to think it’s the latter, which suggests Republicans have produced legislation that would fail in its only ostensible policy goal. You had one job, Paul. One job.